Namesake for not only the eponymous 1966 supercar but most Lamborghinis, noted by Hemingway and countless dead matadors, these are the cunning, ferocious Miura bulls of Andalusia. Miura and his descendants since 1842. Names which would later surface on Lamborghini cars date back to the 19th century: Gallardo was the name of one of the five breeds used by Don Miura, while Murciélago was a particularly hardy bull which survived 28 sword strokes in a 1879 bullfight, prompting the crowd to call for the matador to spare its life, which he did. Like many of its pampered, garage queen namesakes, it lived out its remaining days free of worry. […] there are certain strains even of bulls in which the ability to learn rapidly in the ring is highly developed. 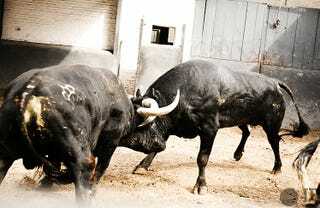 These bulls must be fought and killed as rapidly as possible with the minimum of exposure by the man, for they learn more rapidly than the fight ordinarily progresses and become exaggeratedly difficult to work with and kill. The Miura was just the beginning. Future Lamborghinis would delve deep into bullfighting history. The lovely, understated Islero was named after the bull which killed the legendary Manolete, eulogized in Time magazine on September 8, 1947. Reventón killed the Mexican bullfighter Félix Guzmán in 1943. Diablo was another Miura from the late 19th century. In a twist, the Espada is named after the long sword used in bullfights, while one gets the sense that LM002 will be the name of a cybernetic bullminator set to wreak havoc on the Spanish countryside in 2012. While twelve years of German ownership are slowly turning the tide of bovine nomenclature into a slew of marketingesque Latin and strings of numbers and hyphens, Miuras are still going strong. They show up every year for the Running of the Bulls in the northern Spanish city of Pamplona, and they haven’t gotten any tamer. If you have the stomach for pictures of sudden changes in bodily intergrity, here’s a 2009 Daily Mail piece on what happens when man and Miura collide.